An easy way to secure cables while reducing vibration. Made of galvanized steel with a vinyl cover. Fasteners not included. 1/2" Wd., 0.28" Hole Dia. 3/4" Wd., 0.41" Hole Dia. An easy and economical way to secure cables. Made entirely from nylon, so there's nothing to corrode or rust. Fasteners not included. Diameter Pkg. Qty. Pkg. Qty. This kit contains 10 different vinyl coated clamps, 235 pieces, sizes 1/8" to 1 1/2" diameter. Made of galvanized steel with a vinyl cover. Comes in a metal box. This kit contains 10 different white nylon cable clamps, 300 pieces, sizes 1/8" to 1 1/8" diameter. The cushion will not cut into soft cable when vibration occurs, and it will keep a good hold. Also is more durable than a plastic clamp. Made of steel with a neoprene cushion cover. Fastener hole diameter is 0.26". Fasteners not included. This kit contains 10 different cushion clamps, 225 pieces, sizes 1/8" to 1 1/2" diameter. Made of fine-plated steel with a neoprene cushion cover. Secures wires to frame of truck or angle iron. Heat treated steel coated in black zinc finish. Sold in packages of 50. The high density nylon rubber straps are ultraviolet resistant. 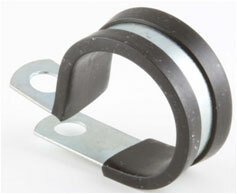 The hooks are made of galvanized steel for extra strength.